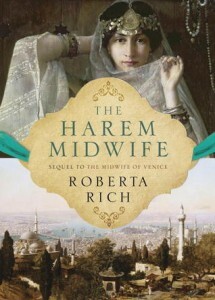 I was delighted to be offered the opportunity to interview Roberta Rich, author of The Midwife of Venice and The Harem Midwife after our Random House Retreat Book Club Chat recently. Rich is a very engaging person, filled with tremendous knowledge about her research subject matter, and it was a pleasure to able to ask her some questions about The Harem Midwife, her most recent novel. Welcome, Roberta! Thanks for agreeing to chat with me. To begin, I’d like to ask if you could tell me a bit about your research process for this book, especially compared to your first. I love the research process, and I loved the research I did for The Midwife of Venice. However, I wanted a new challenge and a new city and it just seemed to fit to spend my time on Constantinople, especially since that’s where we left Hannah and Isaac. I had a lot of fun researching this book! My husband and I went to Istanbul twice, and we ended up renting an apartment in the old Jewish quarter, called the Galata. We spent a lot of time wandering the streets, imagining what life might have been life 500 years ago. I also did a lot of reading, and I talked to a Professor of Jewish Studies at the University of Haifa, who wrote a wonderful book on Constantinople in the 15th and 16th century. We went to a museums and synagogues in the area, and we spent a lot of time absorbing the atmosphere of the city. Did you find that much was similar to your research in Venice, or did you find that things were dramatically different. Oh, very different. The attitude towards the Jewish community in Constantinople was very different, mainly because it was the seat of the Ottoman empire and a Muslim country. The conflict between Muslims and Jews in those days was less so than the Christians and Jews. There was a kind of comfortable relationship between the Jews and Muslims, in those days (kind of sad irony, I guess). In face, the Jews were welcomed in Constantinople. There’s a very famous painting of the Sultan Bayezid the II, welcoming the Jews after they had been kicked out of Spain and Portugal in 1492. It was a very easy relationship and the Jews lived in various districts throughout the empire, including in Fener-Balat, where I visited. It was very cosmopolitan, and there were many nationalities who gravitated to the capital. The Jewish community was very close to being self-governing. The Ottomans left them alone, as long as there was no trouble, and that allowed them to prosper and really grow as a community. In previous interviews you’ve discussed how you’ve had to edit and re-edit your books, taking out parts and using them in the next (example: the man with the silver nose). What did you find to be the most difficult part of the process with this book? There wasn’t much I had to leave out, but I found myself reworking the ending a couple of times. I won’t talk about the original ending, because I might use it in a future book! I think that one of the tricks of writing historical novels is that you do tremendous amounts of historical research, and then you use just enough to give your readers the idea of what life was like then. People are reading novels, not history books, so you don’t want to overwhelm with information. Like every other historical novelist, I have far more information than I could possibly use, but I really enjoy doing the research and having all that information available. You actually caused me some serious angst with the troubled relationship between Isaac and Hannah – I felt that they had grown as individuals while they were apart in book one, and that likely would contribute to their tension. What was in your mind as you were writing those scenes of conflict? Isaac is a very traditional man, and I wanted the world view to be authentic. Five hundred years ago, it was very different from our modern view, and Hannah and Isaac have an extremely traditional relationship. Hannah was left on her own in the first book, and she had to rise to that, but now that they are back together she has kind of gone back to being the more dutiful wife, a bit more under his sway. This fits with the expectations of the time, especially for Jewish women, and Hannah has to almost go back to things the way they were, and leave behind some of her independence. I love that you have some very strong and determined female characters in your book. Who were your inspirations when writing Hannah, Valide and Cesca? The interesting thing about the history of the Ottoman Empire is that it contains so many interesting little notes and facts, so I didn’t have to make up a lot at all. The Valide (the Sultan’s mother) was a very powerful woman, and she’s actually based on a real woman who was, according to the history books, originally Venetian, and the illegitimate daughter of two noble families. She was kidnapped (could I make this up??) from the Island of Paros (now part of Greece) and she was brought as a slave girl to Constantinople, and she was evetuanlly the wife of Selim II. She was 14 or 15 when she was brought there, and bore her first son when she was about 15 or 16. She was a very strong-minded woman, and the undisputed head of the Harem. The Harem was probably several hundred women of various ages, who were brought to the Palace to serve as concubines. It is absolutely true that Murad III, who was her son and the Sultan, was besotted with his wife Sofiya, and it was felt that he was bewitched. Why else would he look at no one other than his wife, as he was surrounded by the most beautiful girls of the Empire. The Ottoman Empire was the largest political entity at the time, with huge reaches and governors and dignitaries would send, as gifts, beautiful slave girls to the Sultan. Despite this, he remained faithful to his wife for close twenty years. It was actually a huge problem as he had to have as many heirs as possible, not only because his wife only gave him one son. One son was not enough – high infant mortality, palace intrigue. It was a conspiracy between his mother and his sister to find the girl to break the spell, and that’s the inspiration for my characters. There seems to be a prequel novella in the making there about the Valide – perhaps something on the website?? That’s a good idea! She could reflect on how she gained her power… I’m taking a note of that, thank you! Which character was the biggest surprise for you when you were writing the second book – did any of them seem to veer from the path you thought you might take? You know, funnily enough I’ve kind of fallen in love with Francesca, or Cesca, because she’s so evil — not evil as such, but so badly behaved! That’s it! She is kind of a bad girl, isn’t she? She’s captured my imagination. I wanted someone to be a foil to Hannah, who always takes the moral high ground, and Cesca never does! I thought long and hard about her background, about what made her into what she was growing up, and about what made her into the bad girl. I was reading a wonderful book by William Manchester called “A World Lit Only By Fire” and it talks about cannibalism in Europe. We think of it as something that takes place in remote places like the Amazon or Africa. In the times I was reading about, it was fairly common as there would be famines that would cause dreadful food shortages and people would be starving to death. I read just a couple of paragraphs about something that fired my imagination – when criminals were hanged, the crowd would press forward to cut the corpse from the noose and devour it because the mob was so hungry. People would boil their shoes, etc. and go to such extremes to stay alive. When I thought about Cesca, I remembered this – this would be her background. Her mother would have held her aloft in a mob, trying to get a piece of flesh for her daughter. Cesca would have felt her mother’s love and concern at that horrible time. Additionally, her mother was a prostitute, and yet somehow she grew up beautiful (not an easy task when you are half-starved) and she developed a steely resolve to prosper and never be hungry again. It’s very clear in the story that Cesca doesn’t act out of malice – she’s a survivalist, and she’s determined to do what it takes to get her little villa on the hillside with the vineyards. I think there’s another novella there in the making, because I’d love to find out what happens to her! Actually, I’ll give you a little hint as I’m working on the third book right now. It’s a very rough draft, but Cesca is in her palatial villa, and she’s trying desperately to hang onto it. It’s a lovely villa on the river, and she has moved in and now has to figure out how to keep it. I won’t say anything more about it, except that Hannah and Isaac have not seen the last of her in their travels! You’ve managed to come up with some really interesting bits of arcane and obscure aspects of Jewish law. What other bits and pieces did you find that was most interesting to you? I thought the whole idea of a Levirate marriage was absolutely fascinating – in fact, the working title of this book was supposed to be “The Levirate Marriage”, but we scrapped it as it doesn’t exactly flow off the tongue. The whole idea of the Levirate marriage, as you know, means that if your husband dies then you are considered to be married to your brother-in-law. What I found intriguing was just how wide-spread it had become. I was talking about this at a book club recently, and there was a young Muslim woman there who informed me that this is also a Muslim practice. She had two cousins who found themselves in this situation many years ago. A young woman lost her husband quite tragically, leaving her with two or three young children. The family put a lot of pressure on her to marry the brother, not only to keep the children in the family but also to keep the estate in the family. It would also protect her as a young widow. It still exists at this time, and I had a few questions about polygamy and whether or not it was permitted by Jews in the Ottoman Empire. I got in touch with this professor I mentioned previously, and I had to ask her, “I’ve read your book, and I want to be sure that I get this right as it’s the kind of thing you most definitely don’t want to be wrong about – was polygamy permitted at this time?” She confirmed that it was the case, and that Jews were allowed to have more than one wife. I thought it was a tremendous plot twist, and I couldn’t wait to include it! Thanks so much for chatting with me today – I wish you all the best with book three and I can’t wait to see what your plans are for Hannah, Isaac and Cesca for the future! Both The Midwife of Venice and The Harem Midwife are available now from Random House of Canada, via your local bookstores, libraries and online book retailers. Many thanks to Random House of Canada and Lindsey in particular for facilitating this discussion.